Printing to a single queue and releasing from any device (Find-Me printing) is essential on large sites. It's easy for users, but often more complicated for systems administrators. Why? Because finding a print driver to work across a mixed fleet of different printer brands can be a frustrating trial and error exercise. PaperCut's Global Print Driver provides a vendor-neutral solution to make both printing and administration easier for organizations with mixed fleets. PaperCut's Global Print Driver works on the widest possible range of printers out of the box, and supports all the print features you’d expect - duplex, color, paper size and tray selection. Plus, on selected printers, you can also select stapling as a finishing option. Unlike universal print drivers from manufacturers, which are designed to work with multiple models across a single brand, PaperCut's Global Print Driver works happily across both multiple models and multiple brands. Do you have a predominant vendor on site and would like to use their driver? Use PaperCut's PDL transforms (advanced) to help make output from one driver compatible with another. 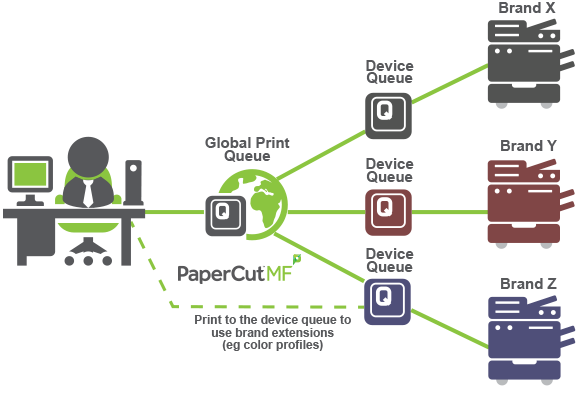 Find out more about the PaperCut Global Print Driver with Find Me Printing and Printer Load Balancing.